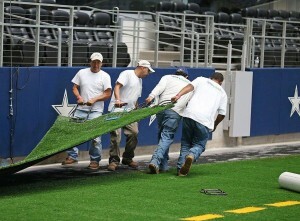 ARLINGTON, Texas -- The Dallas Cowboys practiced on some new turf at AT&T Stadium on Thursday. It's the first change to the field surface since the facility opened for football in 2009. The old turf was getting worn down from the number of events occurring at the stadium and there were too many cross seams. The new turf has fewer cross seams and is softer. "The field looked good, it felt good," tight end Jason Witten said. "I felt like sometimes we slipped in the pass part of it, not using it as an excuse, but it felt good. You can tell it's new, it's firm and I think that's what you want." The team didn't have a morning walk-through at the stadium, instead it was done at the Valley Ranch practice facility for logistical purposes. So the first time the Cowboys got a chance to test the new turf was Thursday. "It's new turf and I think it's good for us to get out there and run around a little bit and have a real football practice instead of just walking around jogging around on it before [Saturday's] game," coach Jason Garrett said. "That's a good thing for our team and we have to take advantage of it."